Geronimo Inns (Young's) pub in Clapton, along the Lea Valley. It was in the 2007 Good Beer Guide but not the 2008 one. 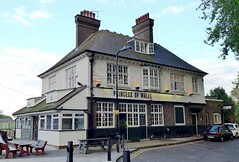 According to the Young's website, it is one of two Young's pubs (the other presumably the Princess of Wales in South Wimbledon) which changed their names to commemorate the death of Diana, Princess of Wales, in 1997. According to the Geronimo Inns website as of November 2015, food is served noon-3pm and 6pm-9pm Mon-Thu; noon-3pm and 6pm-10pm Fri; noon-10pm Sat; and noon-8pm Sun. Opening hours taken from the Geronimo Inns website, November 2015. Last edited 2015-11-03 14:11:39 (version 9; diff). List all versions. Page last edited 2015-11-03 14:11:39 (version 9).